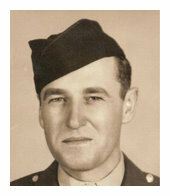 Michael M. Papendick "Mike" of B Company, age 93, of Highland IN passed away on Wednesday, April 9, 2008. He is survived by his wife of 62 years, Helen Papendick (nee Opolski) 2 children Chuck (Cathey) Papendick, Pat Kaleta. 5 grandchildren; Keith Papendick, Janet (Bryon) Goff, Nick Kaleta, Nathan Kaleta and Jason Kaleta. 5 brothers; Helmuth (late Pearl) Papendick, Hebert (Joyce) Papendick, Robert ( Ruby) Papendick, Norman (late Marilyn) Papendick, Arnold (Linda) Papendick. 2 Sisters; Ella (Lawrence) Koepp and Lena (late Ray) McQuiston, many Nieces and Nephews. Mike was a member of Redeemer Lutheran Church Highland IN. Retired in 1976 from Youngstown Sheet and Tube in East Chicago IN. WWII Army veteran serving in the 612th tank destroyer battalion, also a POW in Germany. He was a purple heart recipient. Over 50 year member of the American Legion post 232 who will hold services at the funeral home at 6 p.m.. Mike was an avid bowler. Family requests donations to the American Legion Post 232 in Mike’s name.